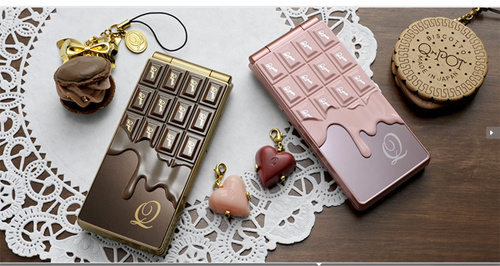 The Melty Chocolate Cellphone is a sweet collaboration between one of Japan's biggest electronics companies and one of its most interesting designers. 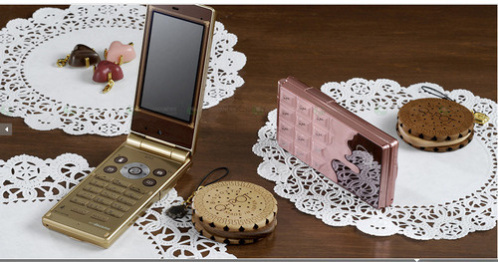 The company is SHARP, the designer is Q-Pot and the phones - in Melty Bitter (brown) and Melty Strawberry (pink) "flavors" are part of a newly released limited edition of just 13,000 from Japan's NTT Docomo. The phones' clamshell exteriors look like melted chocolate giving way to chocolate bar styled keys displaying the Q-Pot logo. Even the on-screen menus display tasty & tasteful chocolate bar motifs! Good looks are one thing; performance is also up to snuff. While not outstanding, the phones manage to provide most of the must-have features common to today's advanced Japanese cellphones: a 3" WVGA ASV display, 8mp CCD camera, 1-seg digital TV tuner, Bluetooth and a waterproof design.